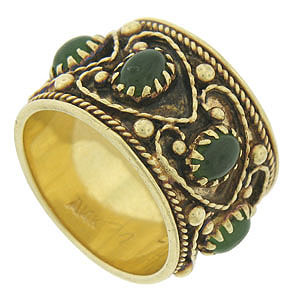 This grand estate ring is fashioned of 14K yellow gold. 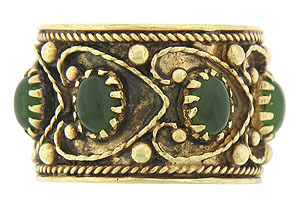 Intricate Etruscan work in heart shaped figures frames eight oval jade stones. Bold milgrain punctuates the open spaces between the decoration. The surface of the band is darkened for drama. Inscribed "EAB to MEM 11-22-69". 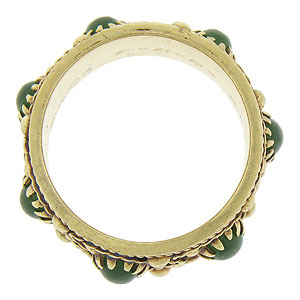 The ring measures 12.97 mm in width. Circa: 1969. Size 5 1/2. We cannot re-size.